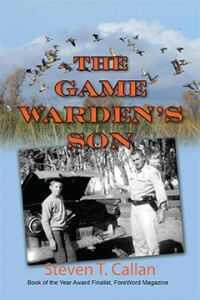 The Game Warden’s Son ($14.95, 272 pages, 6×9 Trade Paperback ISBN: 978-1-60381-345-7), is the new memoir by retired fish and game warden, Steven T. Callan. In a follow-up to his 2013 memoir, Badges, Bears, and Eagles, Callan relates a half century of adventures and investigations from the early 1950s into the 21st century, featuring California wildlife officers: the author’s father, his colleagues, and himself. “A witty and enlightening memoir, The Game Warden’s Son brims over with tales of stake-outs using disguises and subterfuge to trap transgressors…. The book’s slang or jargon related to wildlife is a fun bonus and makes the timely account of environmental protection even more enjoyable.” Read more…. —Frank Galusha, founder and former editor and publisher of MyOutdoorBuddy.com. Publishers Weekly called Badges, Bears, and Eagles, “Jaw-dropping, funny, tragic, enraging, exciting, and hopeful—sometimes all at once.” The memoir was a ForeWord Reviews 2013 Book of the Year Finalist. Retired game warden Steven T. Callan’s love of nature and passion for protecting wildlife took root long before he experienced the adventures described in his memoir, Badges, Bears, and Eagles. In The Game Warden’s Son, he recounts more of his own investigations, along with those of his game warden father and their colleagues. Intertwined with a half century of adventures and investigations is a story of the lifelong relationship between a boy and his father. The book begins in the 1950s in the canyons and on the beaches of San Diego with incidents that sparked Steven’s youthful imagination. After an idyllic boyhood in the Northern Sacramento Valley farm town of Orland, where he rode on patrol with his father, Steven became a game warden himself in the early ’70s, joining the “desert rats” who patrolled the California counties banking the Colorado River. With wry humor, Callan tells how he and his fellow officers outwitted the perpetrators—most of them crafty, some of them hilariously foolish—who poached deer, lobsters, and abalone, baited bears and sold their parts, shot wild ducks to supply restaurants, and killed songbirds for epicurean dinner tables. Their cases took them across the Channel Islands, through the back alleys of San Francisco, up the Sacramento Valley, into the Sierras, and along California’s pristine North Coast. While these dedicated wardens saw their share of greed, they also appreciated the many hunters and fishermen who obeyed the laws and respected the earth’s resources. In the end, it was all about protecting California’s natural resources for future generations, which is what Callan and company did, enjoying themselves every step of the way. Steven T. Callan was born in San Diego, California. With an insatiable interest in wildlife, particularly waterfowl, he never missed an opportunity to ride along on patrol with his father, a California Fish and Game warden. Steve graduated from California State University, Chico, in 1970 and continued with graduate work at California State University, Sacramento. Hired by the California Department of Fish and Game in 1974, he spent thirty years as a warden/patrol lieutenant, starting his career near the Colorado River, moving on to Riverside/San Bernardino, and finally ending up in Shasta County (Redding). Steve and his wife, Kathleen, support many environmental causes. Click here to find Steven online. “Is there some kind of problem, Bill?” said Dykstra. “Warden Callan is going to come aboard,” announced Plett. Hearing all the clamor and my father’s name mentioned, I climbed the steps and peeked out from below deck. Concerned for my father’s safety, I watched as he climbed down from the Marlin and boarded the decrepit old lobster boat. Dad walked past Dykstra and Arnold, headed straight for the cabin entrance. The two lobster fishermen whipped their heads around, slack-jawed and obviously concerned. Arnold must have caught a glimpse of me, because he did a double take and turned his head back in my direction. I quickly ducked below deck. Meanwhile, my father began his search by opening a small ice box in the Rascal’s galley. The box was conspicuously empty. After examining every possible hiding place in the galley, he proceeded to the bunk area. Checking under each mattress, he found nothing but candy wrappers and empty cigarette packages. About to give up and return to the upper deck, the determined warden noticed a scrap of hinged plywood where the door to the head had once hung. The so-called head was such a tight squeeze, it was difficult to imagine how anyone as large as Nate Arnold could fit inside. The paint was peeling off the walls and the toilet paper holder was a rusty shark hook. Lying on the floor, next to the toilet, was an eighteen-inch stack of tattered magazines. What attracted my father’s attention was the toilet seat: it was down and so was the seat cover. “How many men put the seats down unless their wives tell them to?” my father would later ask the crew. With the toe of his shoe, Dad carefully lifted the seat. Inside the bowl were enough undersized lobster tails for a gourmet dinner. Needless to say, these specimens would never see the inside of a boiling pot.